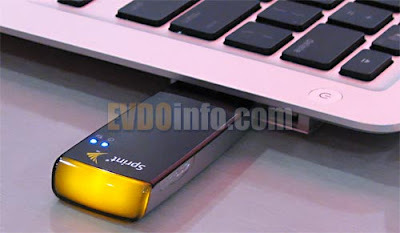 The new "smallest" USB EVDO modem was on display at this years CTIA show, and we were able to get our hands on it. The first thing that impressed us was Sierra Wireless's decision to demonstrate the Compass 597 by using a MacBook Air -- quickly answering the question of "will it fit"? Sierra Wireless describes the Compass 597 as being "about the size of a pack of gum". 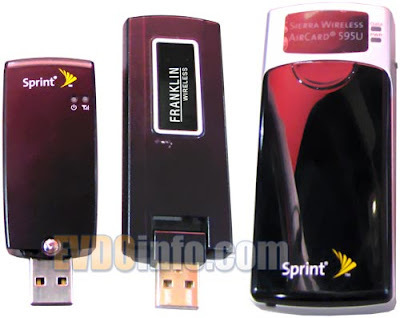 Here it is side by side with the popular Franklin CDU680 as well as the AirCard 595U that it replaces. Aside from being the tiniest USB modem to date, the Compass 597 will be the first Sprint device ever to ship with a connection manager that will work with Mac OSX. The new Sprint SmartView connection manager was demonstrated working on OS X 10.5 aka "Leopard" on the MacBook Air. The Compass 597 utilizes Sierra Wireless' TRU-Install feature, which means that connection managers for Windows Vista/XP/2000 and Mac OS X are on board and the install process begins upon insertion of the device to a computer. The Compass 597 is a Rev-A USB modem, so we expect it to perform as well as prior Rev-A devices. Expected to be available near the end of April, it should be priced at $49.99 after a $50 mail in rebate, on a new 2-yr contract.